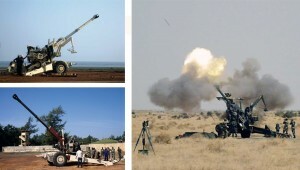 In the current twelfth army five year plan 2012-17, which is in consonance with Artillery Profile 2027, the Indian army plans to upgrade its existing field regiments presently equipped with 105 mm Indian Field Gun, 105 mm Light Field Gun and the Russian 122 mm guns to the 155 mm towed gun system as a universal inventory. This would imply a higher operational preparedness and greater logistical efficiency. Smarter logistics management systems achieved through inventory streamlining and standardisation will act as a force multiplier in the modern day’s hi-tech battle field environment. Thus the artillery rationalization plans key objective is to standardize the equipment profile from a multitude of calibre of guns to a single calibre would be achieved. It stands to gain advantages in terms of streamlined logistics, easy maintenance and repairs including standardization of ammunition. In the Artillery modernisation plan, the Indian army needs 814 Mounted Guns, 1580 Towed Guns, 100 tracked Self Propelled guns,180 wheeled Self Propelled guns and 145 Ultra Light Howitzers at a whooping cost of one lakh crores. Presently the DRDO is developing 155 mm / 52 Cal Advance Towed Artillery Gun System (ATAGS) that will upgrade the 155 mm / 45 Cal Dhanush in future. 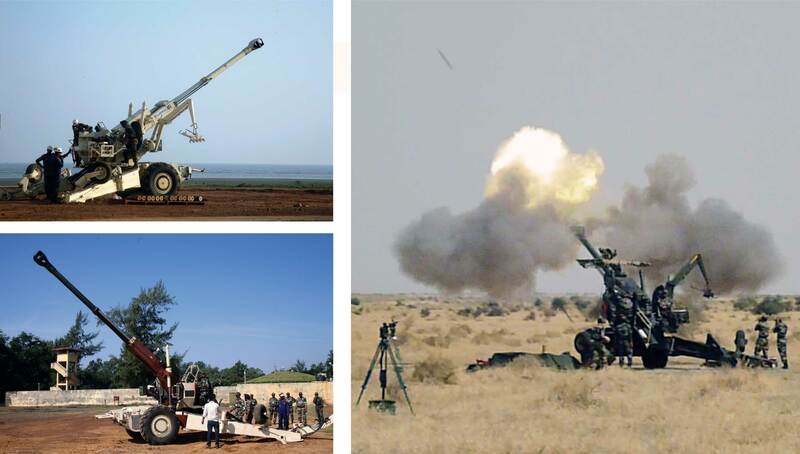 The Advance Towed Artillery Guns System (ATAGS), a light-weight long-range automated gun being developed by DRDO with private participation, will be ready for production by 2019 after undergoing six years of development and testing. Going by the views of experts on gunnery; the physics part of it has proved that a 155mm / 52 Cal is an optimum technical parameter within its class in achieving maximum range with highest accuracy. 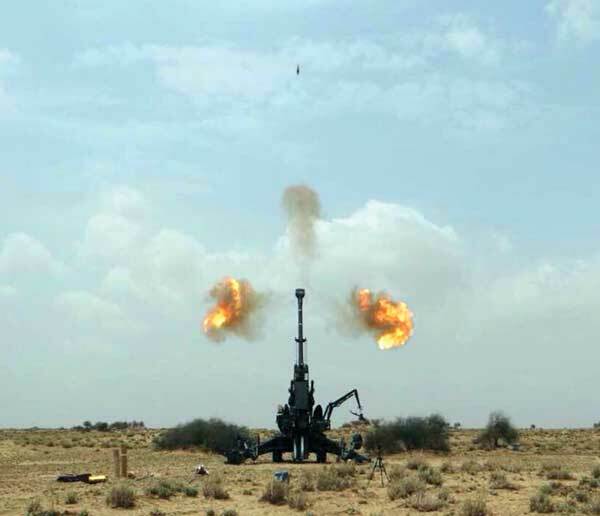 A sources at the Integrated Head Quarters of the Ministry of Defence, say that the success of 155mm / 42 Cal Dhanush under trial is of paramount importance for the futuristic ATAGS programme. The success of Dhanush in all the major trials held so far has brought in cheers and much needed hope to all those who wish to see indigenisation and self-reliance in defence sector a reality. He further added that Dhanush is 87 percent indigenous baring the Auxiliary Power Unit (APU) which is from BAE SYSTEMS and the sighting system from SAGEM. Indian private company FORCE MOTORS is developing an APU which will replace the existing foreign make in times to come. Extolling the virtues of Dhanush further, sources informed the IDR that this gun system has laid the foundations for India catapulting itself straight on to the world stage. India will soon emerge as a leading Artillery Gun design and manufacturer in the form of evolution of ATAGS, which would be the highly advanced version of Dhanush. It will potentially take over guns in this category in the future. “Its long range, light-weight and automation features will help it immensely. Loading ammunition will be fully automatic, and it will be compatible with various kinds of ammo as well. Private players like Tata, Larsen and Tubro, Bharat Forge have all been roped in to complete the project,” this official added. He further added that the ATAGS concept design is ready. “It will weigh 12 tonnes — two tonnes lighter than other guns of its category. It will also be capable of shooting off five successive rounds in short duration. Total development will take three years and testing will last for another three. Interestingly in 2013 the Project Dhanush had reached the stage of being scrapped in all together. This was after a barrel bust during one of the field firing trials. The military experts and the DRDO scientist were demoralised and had virtually given up the hope. A little encouragement from the then Director General (DG) Artillery had put the project back on track and today it is at the verge of making one of the leading success story of the much criticised DRDO. Its long range, light-weight and automation features will help it immensely. Loading ammunition will be fully automatic, and it will be compatible with various kinds of ammo as well. Dhanush as a concept had very few believers! History of indigenous gun development in India commenced in 1970’s when an Artillery Gun Development Team under Brig Gurdyal Singh started functioning in Gun Carriage Factory, Jabalpur. This developmental effort of all stakes holders led by user and supported by manufacturer, designer and the maintenance agencies paid very rich dividends. As per our sources, the Gun Development Team and OFB could place India among the few nations having capability of designing and manufacturing artillery guns. The Gun Development Team continued till late 1980’s and it contributed to successful development of 105mm Indian Field Gun and the Light Field Gun. While the development team had done a remarkable job, unfortunately it was discontinued allegedly under pressure from the international arms manufacturers. This resulted in loss of developmental capability for next generation artillery guns. The 105mm systems were basically mechanical guns with no automation and electronics. The other artillery gun developing nations, thus, took a lead in working on automated guns in 1970’s. The gap of two lost decades of gun development in India resulted in huge technological gap vis-à-vis developed countries. The evolution of project Dhanush was to bridge this gap in a short span of less than two years. Modified double baffle muzzle brake. Modified loading trough to accommodate BMCS Zone-6. Electronic suite for enhanced firing accuracy and auto laying. The electronic suite is a module package, combining a hybrid (Inertial+GPS) Navigation System, a Muzzle Velocity Radar (MVR) and powerful Software solving in real time the ballistics for static or moving targets and for any combination of projectile-change available. The Inertial Navigation System (INS) is an extremely precise system determining the elevation and northing angles of the gun. The system corrects automatically the firing for any variation in ammunition, charge or meteorology. Auto laying is adaptable to any orientation and elevation system hydraulically or electronically powered, it provides an effective solution for automatic laying of the gun barrel. This 155mm and 45 calibre gun has a maximum effective range of 38 km in plains while the original Bofors gun could not fire effectively beyond 27 km. INU, CDU, Phonic Wheel, Travel Lock sensor. Modified Electro-hydraulic Valve Block system. Communication System-STARS V Radio MK II. It is important to place on record a little known fact about this Project Dhanush. 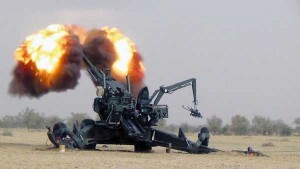 It was started with a unique initiative from Lt Gen Anjan Mukherjee, an Artillery Officer, who was then Director General of Financial Planning (DGFP) maintained the need for in self-reliance in artillery capabilities. 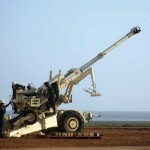 The visionary leadership of DGFP, who later took over as DG Artillery, resulted in creation of the road map for initiating the programme for indigenous development of the 155 mm gun during March 2011. Danush is going to be a first successful flag ship venture under the much hyped ‘Make in India’ mission. With very few optimists in the environment, this small team started taking big steps in gun development capabilities, with a mission to develop a state of art weapon system using available knowledge and manufacturing capabilities of the nation. After these extensive trials and validations likely to be completed by the year end, Dhanush would be produced in bulk at the Gun Carriage Factory in Jabalpur. The Army has already placed an initial order of 114 such guns. 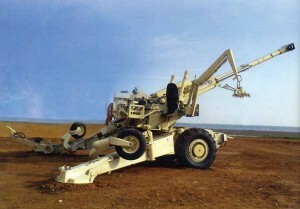 Dhanush is an improved indigenous version of the Swedish Bofors. This 155mm and 45 calibre gun has a maximum effective range of 38 km in plains while the original Bofors gun could not fire effectively beyond 27 km. One can conclusively say that Danush is going to be a first successful flag ship venture under the much hyped MAKE IN INDIA MISSION. This truly looks like the India that many of us thought it could be. India can develop sophisticated complex systems even with extreme metallurgy involved. Outstanding job. Generally the overseas war material suppliers use their strength n stop development programs with help of corrupt politicians n officers. 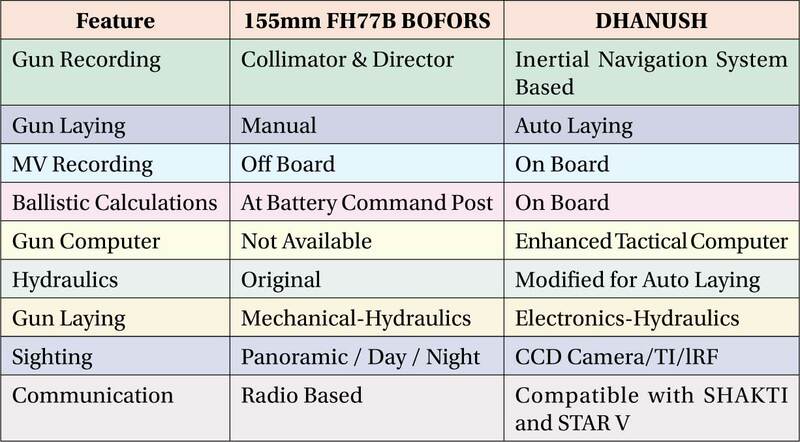 Is the ammunition system of Dhanush and M777 compatible? If so, it will reduce the production and distribution nightmare that was created by use of field guns of varying calibres. The earlier attempts for the same was a failure with the introduction of 155mm Soltam ordnance on 130mm M-46 despite being an excellent system since the ammunition of Bofors 155mm were different from Soltam. Great. Hope now the guns imports will stop and exports start. DRDO should keep ongoing research for new features and improvements on continuing manner in tie-up with the private sector. DRDO now shinning after MODI Govt. and Parrikar as DM. DRDO scientists must be very proud. Congrats. What you are waiting for many mothers lost her child and wife lost her husband son & Daughter lost his father and we are still waiting pakistan is cculprit or not, stop thinking nonsense such matter and showing indian power to pakistan. I AM PROUD FOR INDIA GOING TO BE UNDER WORKING YUDH TERRORIST AND MAOBADI ATANKBADI…..
Its good to see that our PM has a make in India vision and our Defence Ministry is supporting it. Modiji we are proud of you. We need to work in aim of action now. Its good the our PM has a make in India vision and our Defence Ministry is supporting it. Modiji we are proud of you. We need to partner with US and Russia and take a lead. United we stand. The “Dhanush” or Indian “Bofors”: Where will the ammunition come from? 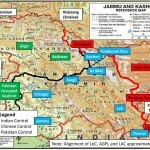 There was none for Kargil until the war was almost over. Fills a hole in India’s fence. Partially. India needs weapons. Its Constitutionally predicated education and government system cannot and may never be able to produce them,. As we saw with “Tatra” trucks, the farce of “make in India” only adds enormous overheads of corruption and inefficiency that are second nature to India. India’s survival depends on getting into a buy, use and throw format. For., at least a century after, (if at all), it expurgates inequality under law and exceptions to the rule of law from its constitution and laws. So, this is, better news than bad. Just about EVERY time anything made in India is extolled to be the best in the world – particularly when it comes to Defense procurement. Even though a few world-class items are indeed made in India. However, facts remain that India still imports 70% of its arms. This number has not changed over SEVERAL decades!!! The point is that one should take such claims made here or elsewhere with a grain of salt. One should only believe a claim ONLY if the evaluation is done by an unbiased party – ideally from OUTSIDE India. Though it’s well known that Dhanush is primarily based on FH-77B Bofors. The problem is of its ammunition which is not yet manufactured in India. Though the factory exists at Nalanda, but production is yet to begin. The same ammunition 155mm shell and BMCS is used by 155mm Soltam (upgraded 130mm M-46). But the unavailability has been affectingthe ooperational preparedness. Hope that the manufacture of 155mm (Naschem-type) also goes together with production of Dhanush. The aim should be to manufacture and use these guns extensively for the follow on Mark II & III. We waste too much time in deciding. Improvement can only come from imperical data from useage not endless debate!! navy for such long coastal line .special navy operater at andaman with advance systems. it need to be change and its happening, its up-to scientist and government policy. scientific revolution dose-not happen in overnight and we have to provide environment for its growth and policy is matter of fact as privatization is burning need for self-reliance. Dhanush has all features required. The attitude shown above has delayed introduction of Artillary Gun for Army. Perhaps India could have a Gun like Dhanush 10 years ago if proper decision had been taken. Sorry for being cynical. Our metallurgy standards are poor. We can’t manufacture a blade like Gillette indigenously. If that is your conclusion then please explain how was MOM possible? We paid good money for the tech designs from Bofors, and the Dhanush is based on that. The tragedy is that the designs were locked away by the OFB and everyone forgot about them till someone looked in that cupboard. Even so, better late than never. What is so great about it, Dhanush is symbol of Congress Party’s failure to understand security requirements. It is based on blue prints of Bofors, they have been siting on these blue prints for over 25 years. How incompetent? If they have manufactured this gun 20 years ago and developed higher calibre we would have earned millions of dollars from export, generated employment. I do want to pay my respect and gratitude to Congress Party, Babus, IA Afsar, PSU, OFB for the great work they did. This gun is of no use in the present circumstances. After the development of weapon locating radars the effectiveness of these gun have reduced. Probably Army officers were making hue and cry for the purchase 0f 145 nos M777 howitzers for $885 million from USA. But this gun range is only 24 Km . All the super powers are switching over to missile. M-777 is a good gun like Bofors. Only advantage over Bofors is the weight. It can be transported to mountain range by C130 plane. In the mountain range we should use helicopter gun ships and missiles instead of field guns. But it cannot move on its own like Bofors. The gun has to be relocated very frequently to escape from the weapon locating radar of the enemy and subsequent enemy fire. The weapon locating radar is very effective. India was not having any weapon locating radar at that times. Now BEL is producing. The Army Chief General J .J. Singh has not taken the right decision to go in for M-777. Only advantage is its weight is less and can be tranpAll the super powers are switching over to missile. M-777 is a good gun like Bofors. But it cannot move on its own like Bofors. The gun has to be relocated very frequently to escape from the weapon locating radar of the enemy and subsequent enemy fire. The weapon locating radar is very effective. India was not having any weapon locating radar at that times. Now BEL is producing. The Army Chief General J .J. Singh has not taken the right decision to go in for M-777. I wonder how he missed the vital point I mentioned. It is unfortunate that these senior Army officers have no war strategy and are carried away by arms dealers. This the condition of the Army and they always blame the Civilian Govt. I think the technical details and specs of defense equipment should not be disclosed in public forums like this. Full technical details are available in the internet. This has helped the general public to point out the mistakes committed by the defense force and guide the Govt. accordingly. The other day I read a report that Army is trying to reject Arjun Mark II on the basis of higher weight. Weight is not a valid reason to reject the main Battle tank. This is an excuse to put pressure on Govt. to purchase foreign . Battle tanks. Some of the Indian Railway wagons can carry up to 88 tons. If the weight is more they may have to impose some speed restriction. Moreover Israeli’s Main Battle tank weighs 65 tons. If they can mange why is Indian Army refusing to accept. Arjun Mark II. Weight of the tanks are going to increase in future if we want better fire power and Anti mines devices. If some of the bridges and culverts are not able to carry this load they should strengthen by giving extra support. The extra money going to spend on imported Tanks should be used for modifying the bridges and culverts in Punjab. This will create employment. Any engineer knows that it is ground pressure which matters in operating a tank than its weight. Ground pressure of Arjun is 0.86 kg per sq. cm and that of T90 is .90 kg per sq. cm. This have been proven in desert trials where Arjun ran as Ferrai and T90 like Maruti 800. 3. Any informed person knows that designing Tank takes 10 years or more. So all is not well in the Army. The correct idiom is “flogging a dead horse” but there is every possibility that the horse ( Scooters India ) is dead by now. This is because the enclosed article ( Dying Horse ) about SIL is almost 18 months old. And as of Dec. 31, 1985, we have such 93,282 dying (or dead?) horses in our country. What I do not know is whether the above mentioned figure includes public-sector ( Govt. owned ) sick-units or not. Are we living in 20th century? Majority of the Army officers or journalist cannot think beyond assault rifles, Mortar and artillery guns. Will it help to win a war in future? I do not think so. The importance and effectiveness of the different types of field guns have come down since the development of weapon locating radar. This we have seen in the Kargil war. Pakistan had effectively used this weapon locating radar against our artillery and this is one of the cause of more casualty in Kargil war. M-777 is a good gun like Bofors. But it cannot move on its own​ like Bofors. The gun has to be relocated very frequently to escape from the weapon locating radar of the enemy and subsequent enemy fire. The weapon locating radar is very effective. 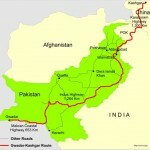 Pakistan had effectively used it in the Kargil war against Indian foot soldiers. The Army Chief General J .J. Singh has not taken the right decision to go in for M-777. I wonder how he missed the vital point I mentioned. It is unfortunate that these senior Army officers have no war strategy and are carried away by arms dealers. DRDO have developed different types of missiles which can be placed far away from enemy radars. None of the guns, tanks, warships , frigates and conventional submarines will be able to escape from missile attacks. India should try to sell this guns to small countries like Myanmar Vietnam, Thailand, Philippines, Indonesia. and African countries. I call upon Indian Def Review to correctly differentiate between information and intelligence ! Plume of smoke and flash suggests that we need to improve the propellant, otherwise it will give away the position, cause excessive fouling in the barrel and reduce life of the gun. If Dhanush is a success, have we repaired our 220 Bofors, which were off road due to want od spares? Good to know. Having OG do the design and producation made all the difference, I am sure. I hope that ordinance and production are passed on entirely to blue berets. Otherwise we may not have ammunition for these guns when the next Kargil comes around. Good article by (CO) Danvir Singh. Lets hope OFB and DRDO keeps improving the specs of this gun and doesn’t give in to International arms lobby or to middlemen who want to buy Foreign over Indian goods, although they may be similar but not identical products. This should be kept ongoing till long-distance firing guns, projectiles as well as components and spares are all Indian. Also training corps in IA Artillery and Mechanised regiments should train their soldiers how to use this on the Eastern and Western frontiers. I sincerely hope similar approach is given to reverse engineered fighters which should be built like china built its own Aircraft Industry as well as Indian companies making radars and SAM systems. The initial few products will be average or slightly above average but whats important is the knowledge, mechanical and electronic capabilities, skilled personnel, blueprints & designs, production tools and layouts which can then be used to build finer and more sophisticated products (fighters, helicopters & SAMs) later in few years. That capability should be developed by India instead of wasting millions of dollars on foreign arms and their licenses and maintenance contracts. No doubt this is a good development. Sweden had taken 20 years to develop. But I would like to know will it be really useful. in a modern war. The future war will be fought by using missiles. In the Kargil war we lost many Jawans life because Pakistan had weapon locating Radar. How will you save this guns from enemy missile attack.? Will it be possible to shift the gun to another location.. I feel missiles batteries mounted on mobile vehicles is good. Kindly clarify my points. Thanks for the update. Impressive to say the least. Kudos to the design team. Hope we can maintain quality!! Looks like bofors only. Hopefully not another cut copy paste. Danvir Singh I still say somebody should keep pressing the OFB’s टेंटुआ until they become so efficient 100 guns a year. I think IA will need over 1500 guns like this, plus mountain corps too. Development of Dhanush – basically from the technical blueprint of Bofors comes at a time when Indian artillery is badly depleted. Only hope that its teething problems have been sorted out (including malfunctioning of gun barrel during trials) and it now meets the aspirations of our gunners. Thank you very much @Danvir..keep in touch from INDONESIA. India is always doing well.great discover.